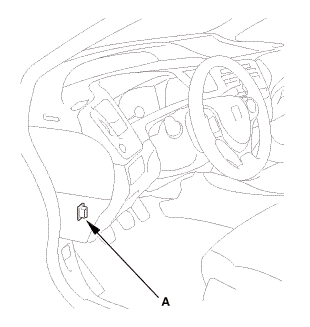 NOTE: Make sure the TPMS control unit mounting bracket is not bent or twisted as this may affect its communication with the tire pressure sensors. 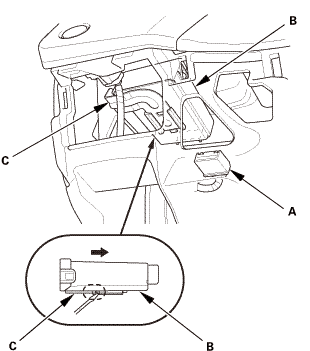 Remove the TPMS control unit (B) from the bracket (C). NOTE: Make sure the TPMS control unit is properly installed. 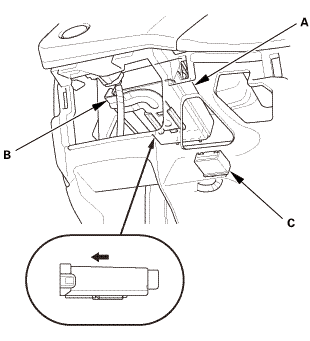 You will hear a click when the TPMS control unit is securely mounted on the bracket. 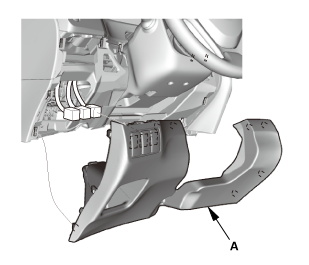 Install the TPMS control unit (A) to the bracket (B). 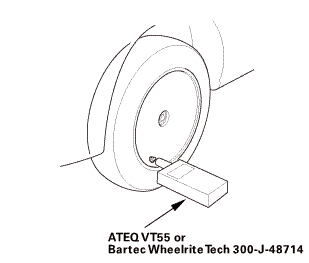 The TPMS tool is needed to do this procedure. Let the vehicle sit for at least 5 minutes to allow the tire pressure sensors to switch to sleep mode. To ensure the TPMS control unit memorizes the correct sensor ID, the vehicle with the new tire pressure sensor must be at least 10 ft (3 m) away from other vehicles that have sensors. When doing a tire rotation, memorizing the sensors in not needed. Select Sensor ID Learning from the Mode Menu on the HDS. Follow the HDS screen prompts to turn on the TPMS tool. Hold the TPMS tool near the valve stem of one wheel, and memorize the tire pressure sensor ID by following the screen prompts on the HDS. If you turn the ignition switch to LOCK (0) before memorizing all four sensor IDs, the memorizing sensor ID is canceled. If more than one sensor ID is displayed on the HDS, verify that the vehicle has not been driven for 5 minutes, and there are no other vehicles or tire pressure sensors within 10 ft (3 m). See the HDS Help menu for specific instructions. Repeat step 3 for each wheel until all four sensor IDs are memorized. When all four IDs are memorized, the low tire pressure indicator blinks. Test-drive the vehicle at 28 mph (45 km/h) or more for at least 1 minute. Make sure the low tire pressure indicator does not blink. Make sure the tires are inflated to the specified tire pressure listed on the doorjamb label.